Join Cornel West, Graham Burnett, Saskia Bos, Jill Magid, Carl DiSalvo, McKenzie Wark, Mendi+Keith Obadike, Cristina Goberna and Urtzi Grau, Anjum Asharia, and Marisa Jahn for an event rife with pleasurable and productive friction. Building off of a highly agonistic public symposium presented by the Walker Art Center and Northern Lights.mn in Spring 2012, Pro+agonist is an event that explores the productive possibilities of ‘agonism,’ or a relationship built on mutual incitement and struggle. Participants will emerge with a greater appreciation for duking it out and taking it to the streets. 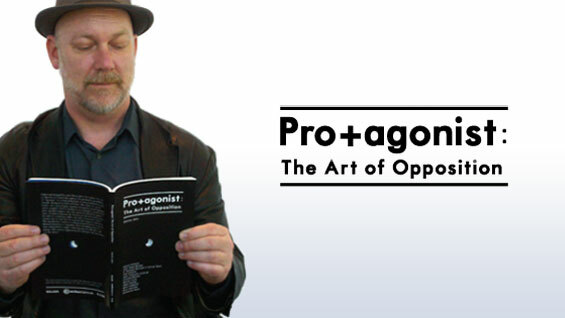 ‘Pro+agonist: The Art of Opposition’ is a book and set of playing cards that explore the productive possibilities of ‘agonism,’ or a relationship built on mutual incitement and struggle. Designed in black and blue — the colors of a good bruise — ‘Pro+agonist’ brings together writings by interdisciplinary artists, scientists, CEO’s, crackpots, war strategists, psychotherapists, and philosophers who raise questions about the importance of political dissent, the function of discord in discourse, the rules of escalating conflict, the roles of parasites within systems, the ins and outs of concord and congress, and more.